All about gold today. Ballarat is where early prospectors found it just lying around for the picking up: huge nuggets scarcely buried. And they still are. We saw the actual Goldasaurus (better original name: Bob's Joy) which was found just 60cm deep with a metal detector in 2003 - all 4.4kg of it. Mind, that was nothing compared to Welcome Stranger, a massive knobbly rock that weighed around 70kg - again, pretty much tripped over back in 1858 at the Red Hill Mine. There's replica of that mine too at Sovereign Hill, an excellent outdoor museum which reproduces a mining town of that period: shops, manufacturing, accommodation, mines and a foundry, all populated by very authentic-looking staff in period uniform busy doing things like firing a musket, singing, making lollies, tins, iron stuff and, most excitingly, a gold ingot. We watched it being poured into the mould and tipped out again remarkably quickly, a beautiful object, that some of the audience were allowed to hold. "Run, lady, run!" someone called out, when we were told that this one small brick was worth $140,000. 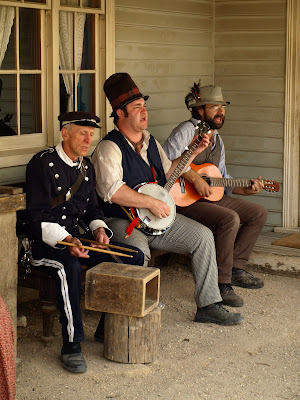 It's been a good day out, and it's not over yet: tonight we eat in a hotel at Sovereign Hill before watching a son et lumiere show about a miners' rebellion. I do hope it's going to be better than the last one I saw, a lame affair of coloured lights and overblown commentary at the Red Fort in Delhi: though my impression was probably jaundiced by having minutes previously fallen down a flight of stone steps and whacking my head. I've still got the lump.